Our copper sinks are rustic not only because they look antique and classic, but because they’re made from the very same copper that was used hundreds and thousands of years ago. In fact, 80% of all the copper ever mined is still in use. “Secondary copper” has been been reclaimed from old objects, melted down, refined and formed into new objects, while primary copper originates from ores, but the two are indistinguishable and equally valuable. Due to its resilient anatomical structure, copper can be reused infinitely without any damage to its integrity or quality. With a boiling point of 5000 degrees Fahrenheit, copper can withstand anything. The reusability of copper makes it a cost-conscious as well as eco-friendly sink alternative. Indeed, copper that has been reclaimed saves resources and energy, requiring 85% less energy to create than newly mined copper ore. Though copper is highly resilient and antimicrobial, so are other metals. What truly sets copper apart is its beauty and history. Ancient civilizations began mining and using copper tens of thousands of years ago. Kings and queens were crowned with copper, while warriors wore copper bracelets to battle. The wealthiest homes were adorned with copper artifacts for decoration. As copper ore became more easily accessed, it became a top choice for sinks and cookware in upper class homes. Its unique chemical properties make it a common-sense option for piping, appliances, wiring, cookware and, of course, sinks. Copper sinks were first made in the 19th Century, and they’ve never fallen out of fashion since. 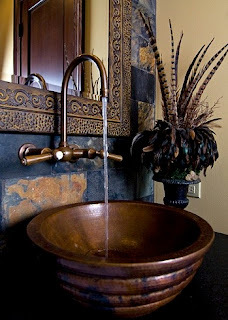 Copper sinks exude a style that is both classic and modern. Their patina deepens over time, getting more beautiful with age and use rather than wearing out—what’s known as a “living finish”. Copper starts its patina journey as a pinkish orange and gradually darkens over time until it becomes a russet, rustic brown. Copper does not corrode or rust over extensive usage or with time, making it an ideal choice for any sink.